Flavoured with ginger and fennel seed paste, the sweet smelling kalai er dal can have 2 different tastes. 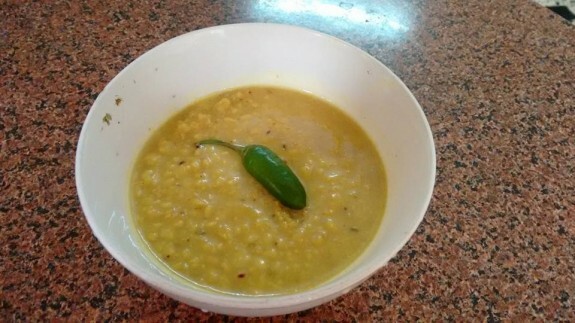 If you do not roast the dal before cooking, then it tends to get a bit slimy. But if you roast it and then cook, then the slippery texture will gone and you could a flavourful aroma of the dal. This dal could be best enjoyed with alu posto and rice during lunch in Bengali family. This is a normal meal with close family to enjoy. 1. Prepare a wet paste with 5tsp fennel seeds (mouri) and ginger (ada). 2. Now, take a pan and dry roast the kalai dal till you get a roasted good smell and 50% of the dal becomes light brown. 3. Now cook the dal with almost 3 times of water (3 cups) and add ½ tsp of turmeric powder. The dal must be lightly cook and do not mash it up. It will take 8-10 mins or more to cook the dal. 4. Heat oil in a kadai or pan. Add 1 slit green chilies and hing. After that, add ginger-fennel seeds paste (ada-mouri bata). 5. Fry it for few mins and you will get a sweet smell of the masalas. 6. Add the dal and about 1 cup of water, rest of the green chillies and sat. Let it cook according to the consistency or thickness you want. Don’t let it be too thick. 7. Serve it with rice, alu posto and some bhaja (fried veggies). Note - To add more taste to this dal, you can add chopped coriander leaves or some coconut into it. Also, adding of ghee at the end of the moment while you turn of the gas will add a great aroma and flavour on the dal.